‘Tis the season…with Halloween around the corner, there are plenty of Halloween costume parties. This past weekend I attended a “Halloween/Birthday/Goodbye” party. My friend Kota is moving to India for a year, can you believe it?! Any occasion calls for a special treat, so I wanted to do something fun for the party that Kota would love. Knowing that sweet treats would be welcomed with open arms, I decided to make a crowd pleaser (chocolate and peanut butter, what could be better?!). 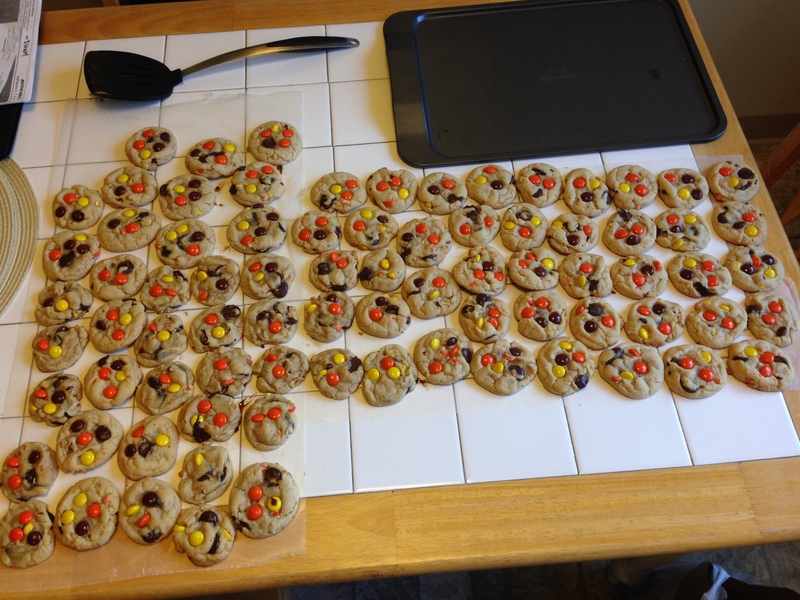 BUT it had to be festive for Halloween (yellow, orange and brown Reese’s Pieces are perfect Halloween colors)…AND it had to be an easy grab-and-eat treat…COOKIES! Bam! 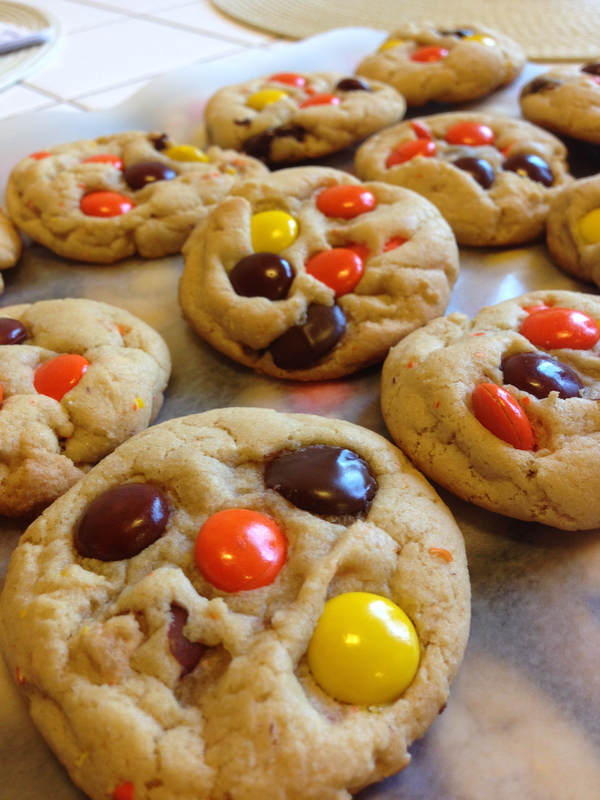 Chocolate Chip Reese’s Pieces Cookies. I took an easy chocolate chip cookie recipe and switched it up a bit. Can you guess what I was for the Halloween party? Something baking related, of course! 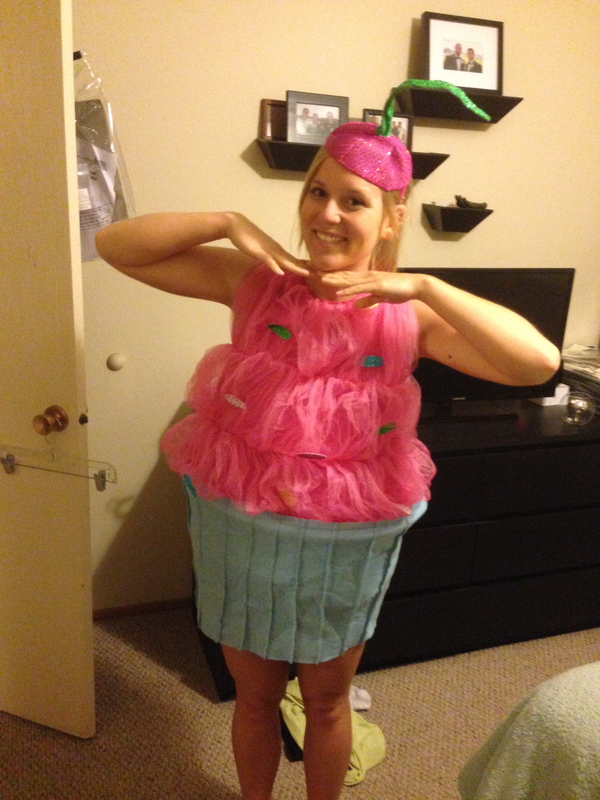 Yes, that’s right, I was a CUPCAKE – I just couldn’t help myself…and I can’t wait to wear this costume to the office for Halloween on Thursday! Now back to the cookies…yum! Step 1: In a large bowl, mix butter and sugar together until fluffy. Add vanilla and the eggs one at a time. Beat until smooth. Step 2: Mix baking soda, baking powder, salt and flour in a medium sized bowl. Add mixture slowly to the butter/sugar mixture. Fold in the crushed Reese’s Pieces and chocolate chips. Step 3: Spoon dough onto a lightly greased cookie sheet. I rolled them into small 1” balls and then flattened them with the palm of my hand. Add as many Reese’s Pieces on top as you would like. As everyone has their own preference for sweetness, I did some with no extra Reese’s Pieces on top, and some with as many as 4 or 5 Reece’s Pieces. Bake 12 per sheet at 350 degrees for 8 minutes. Time may vary, depending on your oven. Check the cookies after 6 minutes, again at 7 minutes, etc. 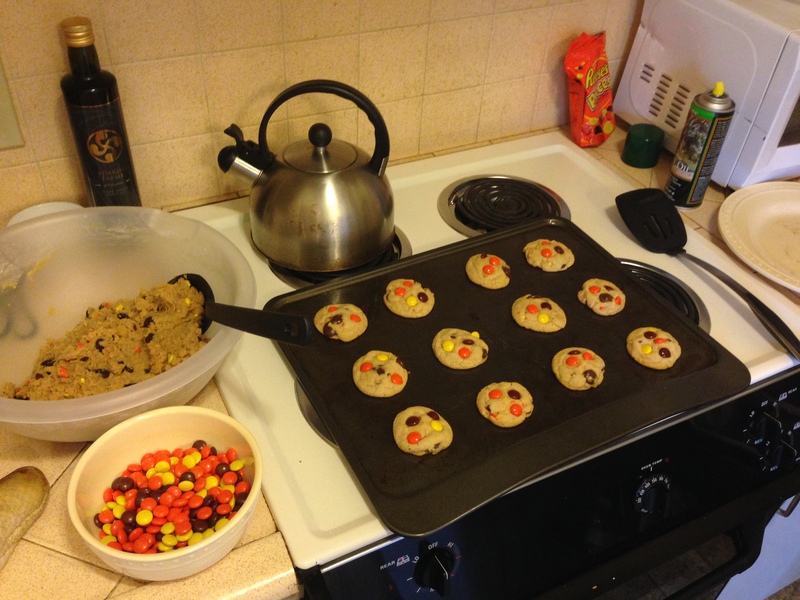 I doubled the recipe and made LOTS and LOTS of cookies for the party. I know it’s hard to believe based on the picture above…but…I should have made MORE! The cookies were gone within a few hours. I can’t wait to make them again for Halloween this week! 1. In a large bowl, mix butter and sugars together until fluffy. Add vanilla and the eggs one at a time, then beat until smooth. 2: In a medium sized bowl, sift the baking soda, baking powder, salt and flour. Add the dry ingredients to the butter/sugar mixture in thirds. Fold in the crushed Reese’s Pieces and chocolate chips. 3. Spoon the dough onto a lightly greased cookie sheet. Roll into 1 inch balls and flatten with the palm of your hand. 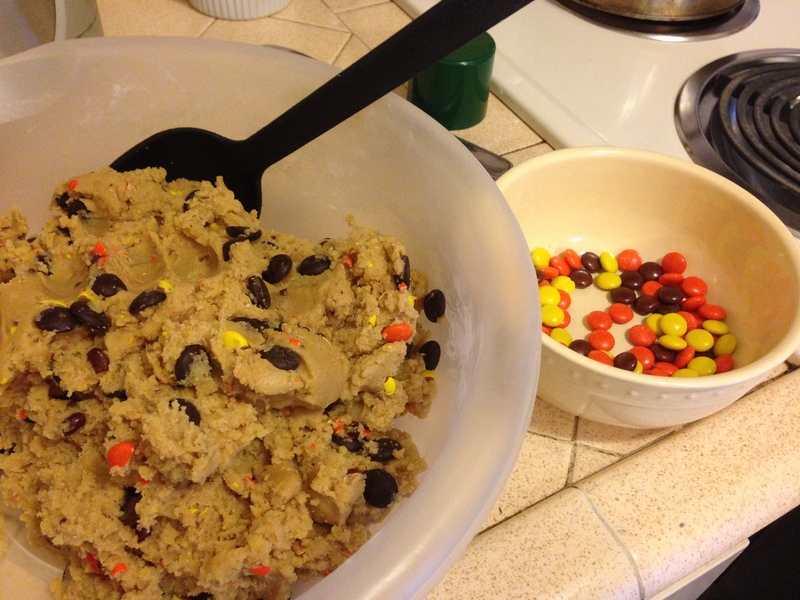 Add whole Reese’s Pieces on tops of cookies (2 to 4 per cookie). Bake at 350 degrees for 8 minutes. Time may vary, so check the cookies at 6 minutes, just to be safe! 4. ENJOY! Be sure to eat one hot out of the oven. Nothing is better than melted chocolate chips oozing out of a delicious cookie! Needless to say, the cookies were A HIT.